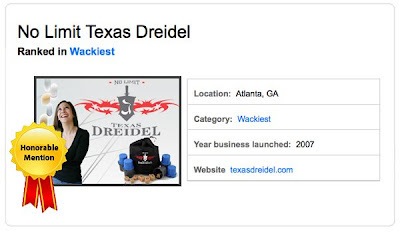 No Limit Texas Dreidel gets an Honorary Mention in Startup Nation's Home Based 100 Business Contest in the category "Wackiest." Thousands of businesses entered the contest. Businesses were judged and chosen as winners or honorable mentions by a panel of entrepreneurs and business gurus. Buy the game on ModernTribe.com or at our other retailers selling Texas Dreidel across the United States including Bloomingdale's where you can find the Deluxe Edition. Jennie (me) will be profiled for her business acumen for both her businesses: No Limit Texas Dreidel and ModernTribe.com in an upcoming edition of the Atlanta Business Chronicle. Stay tuned.